We developed an algorithm that creates cut-out sheets for paper models from 3-dimensional textured polygon meshes. The cut-out sheets are optimized to reduce crafting time and usage of paper and glue. The input must be a non self-intersecting orientable manifold polygonal mesh that describes the surface of an object. 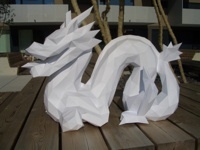 The resulting PDF file contains the parts for building the object as a paper model. After printing the PDF file on a normal computer printer, the parts of the paper model can be cut out, folded at the dotted lines and finally assembled with some glue according to the numbered tabs. If you have a computer model that you would like to have as a paper model and if it can be put on this page - just contact us!